Wednesday - in the kitchen - recipe | A.B.E. Remodeling, INC.
Hello Everyone. 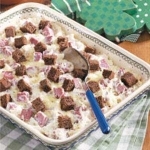 Well, tomorrow is the wearing of the green..otherwise known as St. Patty's day….we thought we share an Irish recipe with you today…so rush on out to the store and get your ingredients and make this your St. Patty's day dinner. TOTAL TIME: Prep: 10 min. Bake: 25 min. In a large bowl, combine the sauerkraut, corned beef, sour cream, onion and garlic. Transfer to a greased 11-in. x 7-in. baking dish. Sprinkle with cheese and bread; drizzle with butter. Bake, uncovered, at 350° for 25-30 minutes or until heated through. Yield: 4 servings. Enjoy this recipe with a full-bodied white wine such as Chardonnay or Viognier.